My wife and I did a quick trip to Portland last weekend to visit some family, and decided to make it an overnight and check out the local craft beer scene. Over the last two days I’ve documented the breweries we visited in the afternoon, Allagash and Austin St., then Foundation and Bissell Brothers. After checking out the breweries we headed down to the Old Port for a nice seafood dinner folowed by visits to a few local watering holes. We grabbed a before dinner pint at Sebago Brewing Company’s Portland Brewpub, then hit Novare Res Bier Cafe and The Thirsty Pig after our meal. I am getting a little too old to stay out all night drinking, so the stops were on the brief side, but gave us a chance to check out each place and get a feel for what they offered. After a little walking tour of the Old Port we decided to grab a beer at Sebago Brewing and watch the Belmont Stakes before heading to dinner. The brewpub occupies a large space with a massive bar and plenty of tables. 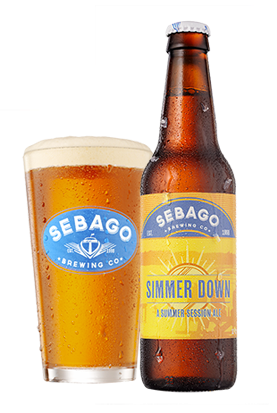 The draft selection is all Sebago beers, including their popular Frye’s Leap IPA. They also have a rotating cask, this past weekend it was their Simmer Down Summer Session Ale. The Summer seasonal was light and refreshing, noticeably hoppy without wrecking the palate, perfect for a warm summer day. We didn’t eat at Sebago, but the food coming out of the kitchen looked and smelled delicious. A full meal will be a strong consideration on our next visit to Portland. The first stop after dinner was Novare Res Bier Café. This establishment has been recommended to me many times by craft beer enthusiasts, both locals and those have visited the city from out of town. The bar itself is a little off the beaten path despite being in the middle of the Old Port. Once you find your way Novare Res occupies a large basement room, with exposed stone walls and communal tables. There is also a spacious patio area, which was perfect for some outdoor beers on a warm June evening. The beer menu is extensive and impressive, I think I could go back every day for a month and still get excited about new beers to try. We focused on beers brewed in Maine and not distributed to Mass, sampling beers from Oxbow and In’finiti as well as the Maine Island Trail Ale from Rising Tide. In addition to a stellar list of local selections, Novare Res has a solid draft list of US and international beers. The crazy menu is their bottle list, which spans multiple pages and includes many hard-to-find imports. I would love to spend an afternoon with some fellow beer geeks grabbing bottles of rare Belgians to share, but with a packed house on a Saturday night I kept it simple. 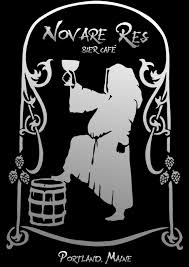 Next time I’m in town I will take my time and enjoy more that Novare Res Bier Café has to offer. Our final stop of the night was The Thirsty Pig, right down the road from Novare Res. 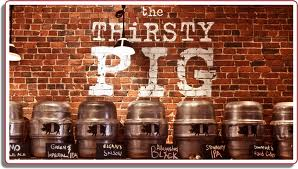 The Thirsty Pig has a large dining room with a sizeable bar towards the rear, as well as patio seating out back. 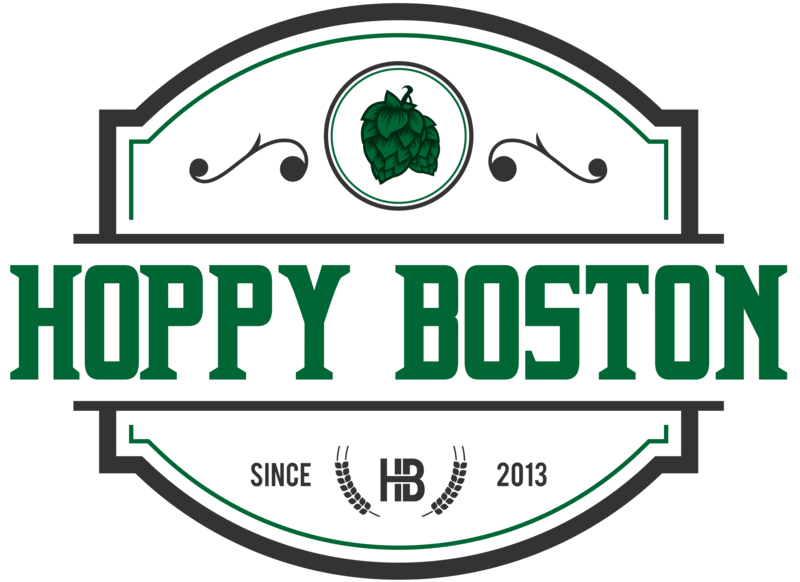 The beer list is very heavily Maine focused, with selections from Maine Beer Co., Rising Tide, Allagash, Shipyard, and many other local breweries. I had a bottle of Lunch, the spectacular IPA from Maine Beer Co., a perfect way to end a great day in Portland. I would like to go back to the Thirsty Pig for a meal at some point, just looking at the picture of their sausages on the website is making my mouth water. That ends my recap of last weekend’s trip to Portland, ME. It was a great day, I sampled some amazing beer and can’t wait to go back at some point in the near future. I strongly recommend all craft beer enthusiasts to make the trip. There is so much amazing beer, many of which you can’t find outside the great state of Maine.